Hostal Art Madrid Guest House, Madrid. Hotel Hostal Art Madrid. There's a place that will make you feel at in Madrid's historic center. 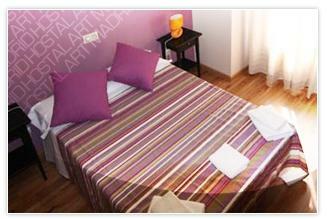 Hostal Art Madrid offers good quality at great prices. It has an ideal location between the famous Plazas Jacinto Benavente and Tirso de Molina. Our young and friendly guest house is non-smoking and been fully renovated. Both single and double rooms have a bathroom, air conditioning and heating. Hotel services include Wi-Fi, 24/7 reception, luggage storage and friendly service.